Buying a leg of lamb, on a whim, I asked the butcher to bone it for me. 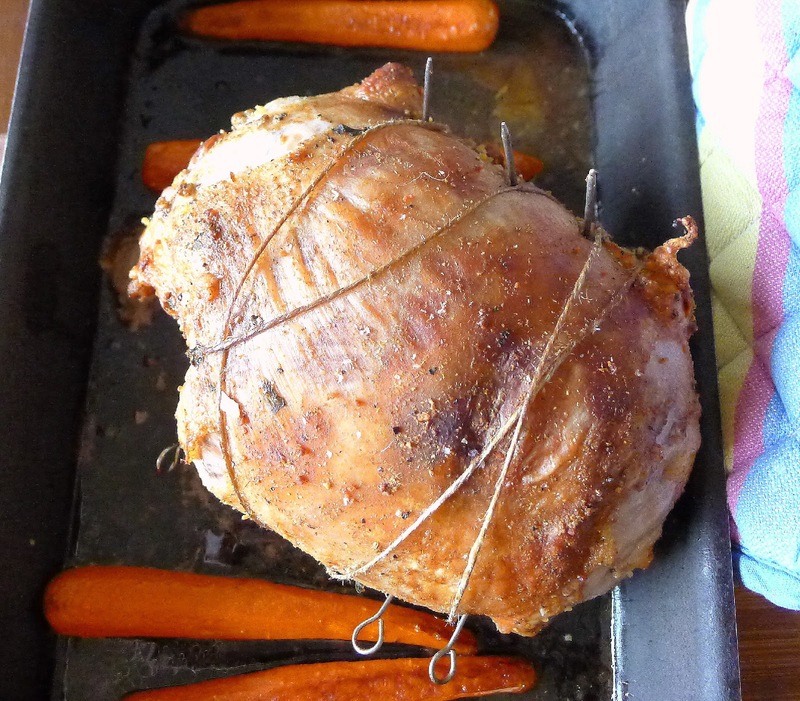 He removed the long leg bone without opening out the meat, leaving a pocket for stuffing. Now, what to stuff it with? I recalled many years ago hosting a mechoui party. Mechoui is the Moroccan roast lamb. I bought a whole lamb and my friend, Dominique, who grew up in Morocco, was in charge of roasting it. 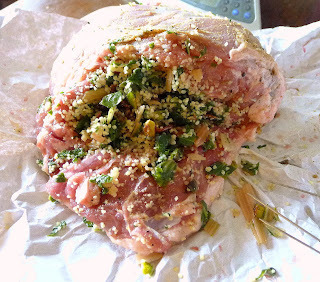 We stuffed the lamb’s cavity with a mixture of cous cous and parsley, maybe some chopped onions. I don’t remember exactly. 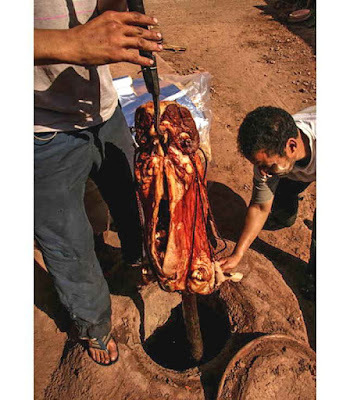 Once sewed up, the animal was trussed, brushed with olive oil and positioned on a stout stick over smouldering coals. This was an August afternoon. Dominique and his pinche, Mark, turned the lamb for hours, basting it occasionally with salt water to keep the skin crisp. Dripping with sweat, Dominique stripped to his skivvies and turned the garden hose on over his head. The meat was succulent and deliciously wood-smoke flavored. 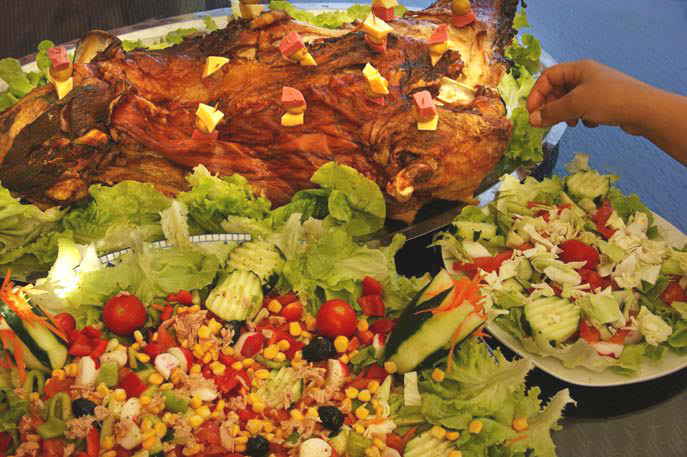 I served an array of Moroccan and Middle Eastern salads and vegetable dishes to accompany the lamb. What a feast. Dominique is French photographer Jean Dominique Dallet (http://www.jddallet.com/) He grew up in Fes (Morocco), studied and worked in France and Denmark, before setting up home base in southern Spain, where I got to know him. Dominique clocks around 100,000 miles a year, traveling in search of new images, on assignment for magazines and books worldwide. I rode shotgun on several of Dominique’s forays through La Mancha, where we collaborated on magazine articles. Dominique tells me that traditionally mechoui was cooked (no stuffing) in a vertical clay oven, “until the meat is falling off the bones, so that you can eat it with your fingers, without a knife.” Men cook the mechoui, women serve it. 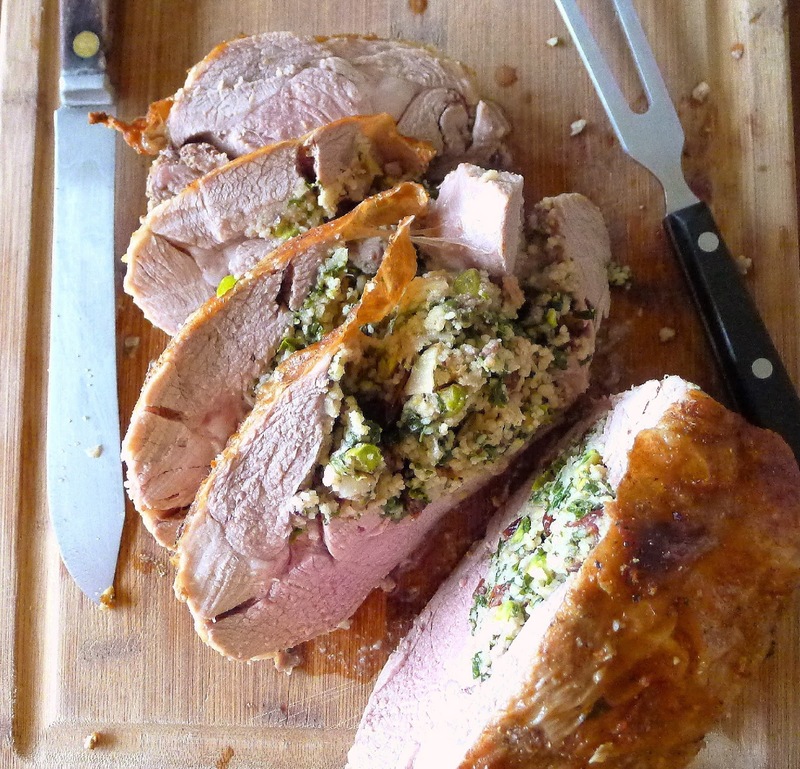 Kebabs of liver wrapped in fat might precede the lamb, Salads are the only accompaniment to the roast lamb. Today in Morocco, he says, a typical mechoui is sent to roast in the neighborhood bread oven. 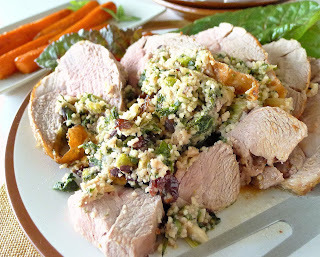 It was the memory of that mechoui party that inspired me to stuff the leg of lamb with cous cous. 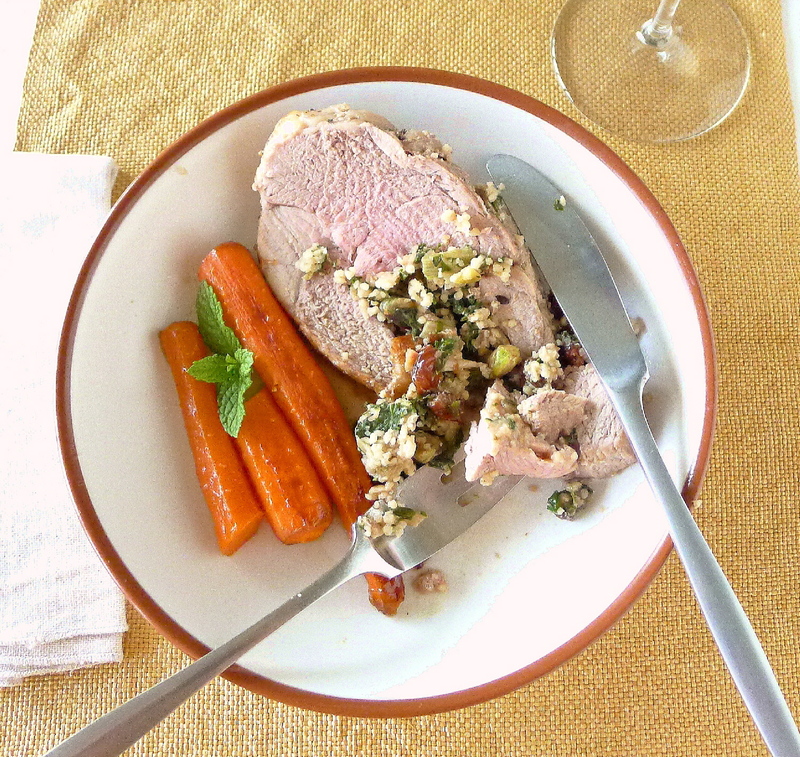 Here's my version, boned leg of lamb stuffed with cous cous, chard and pistachios. Boned leg of lamb is stuffed with cous cous, chard and pistachios. Roast lamb, a small feast. Stuffing soaks up meat juices. You may need a spoon to serve it. The meat has a deep pocket where the bone was pulled out. Another way to bone the leg is to butterfly it, by cutting it open, removing the bones and cutting horizontally through the thick sections to create a slab of meat that is more or less of equal thickness. 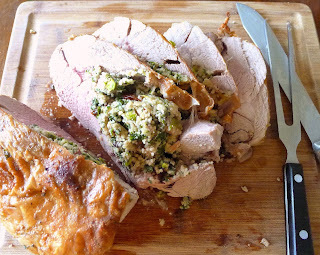 The stuffing is spread on the meat and rolled up. Either way, the meat must be tied to keep the stuffing in and give the roast shape. 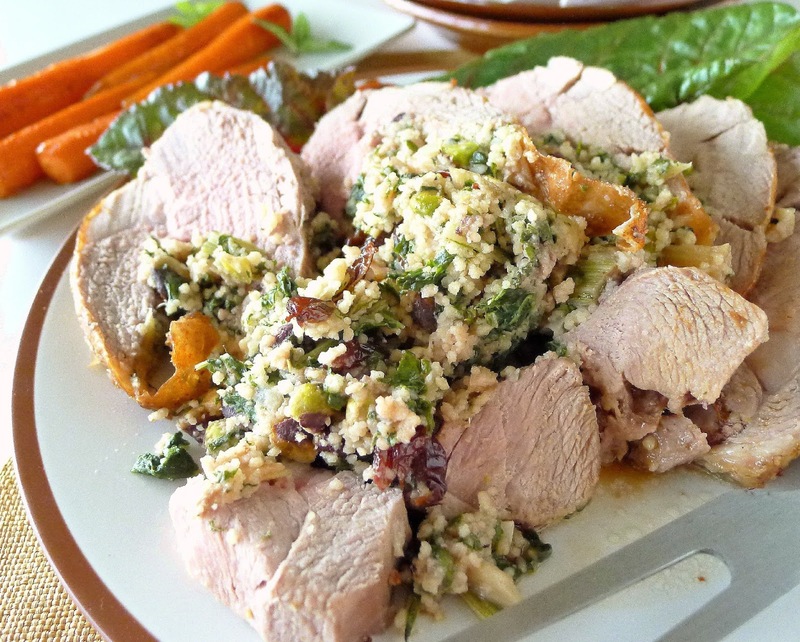 Cous cous and chard stuffing. Press stuffing into pocket of lamb. Place the cous cous in a heat-proof bowl. Pour over the boiling water. Add 2 teaspoons oil and salt. Cover and let steam until cous cous is tender, 10 minutes. Fluff the cous cous with a fork. 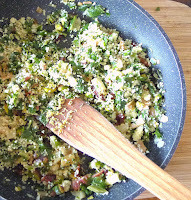 Cook the chard or spinach in a little water until it is tender. Drain, well. Heat 1 tablespoon of oil in a skillet. Sauté the onions and garlic until softened, 8 minutes. Add the chard and sauté until moisture evaporates. Add the raisins, pistachios, parsley or cilantro, ½ teaspoon salt, pepper and lemon zest. Remove from heat and stir in 1 cup of the steamed cous cous. Combine crushed garlic, salt, coriander, cumin, black pepper and 1 tablespoon oil. 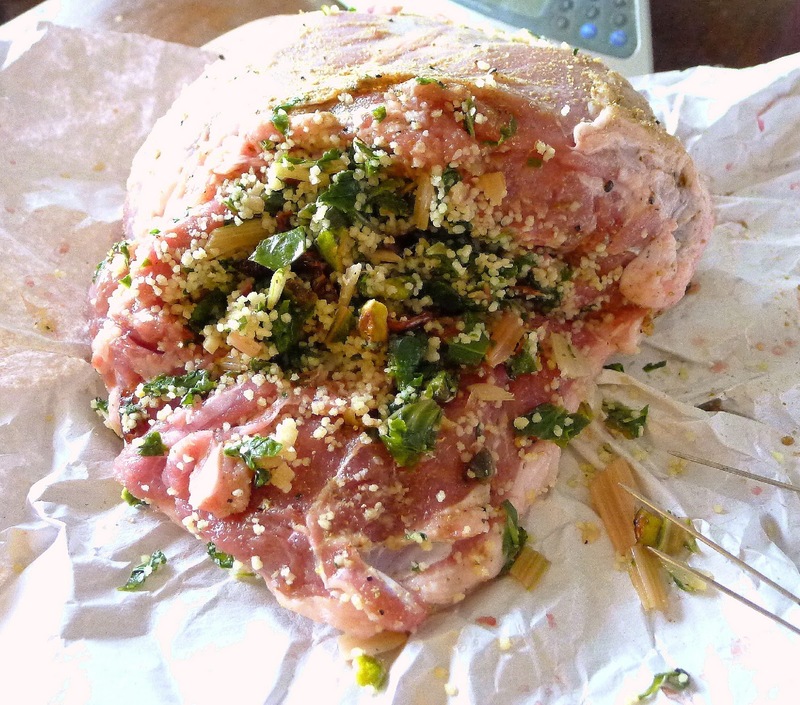 Rub this mixture on the lamb, inside and out. Turkey skewers and twine to close the pocket. 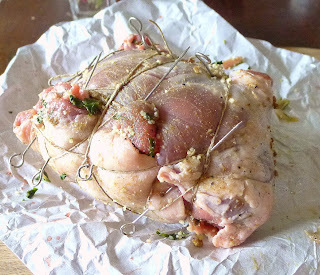 Use skewers and kitchen twine to close the pocket’s openings. Tie the meat so that it keeps its shape. 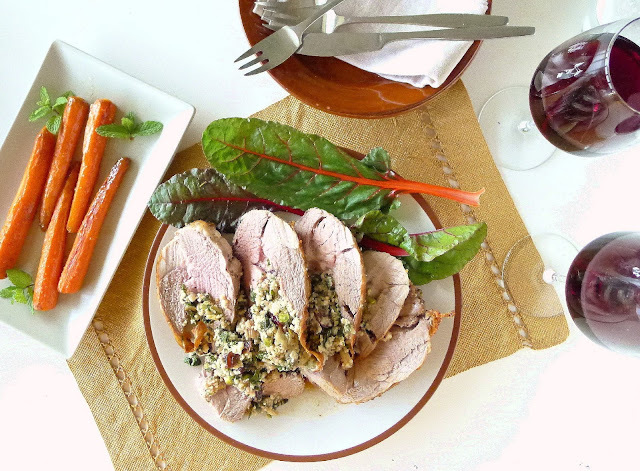 Roast vegetables with the lamb. 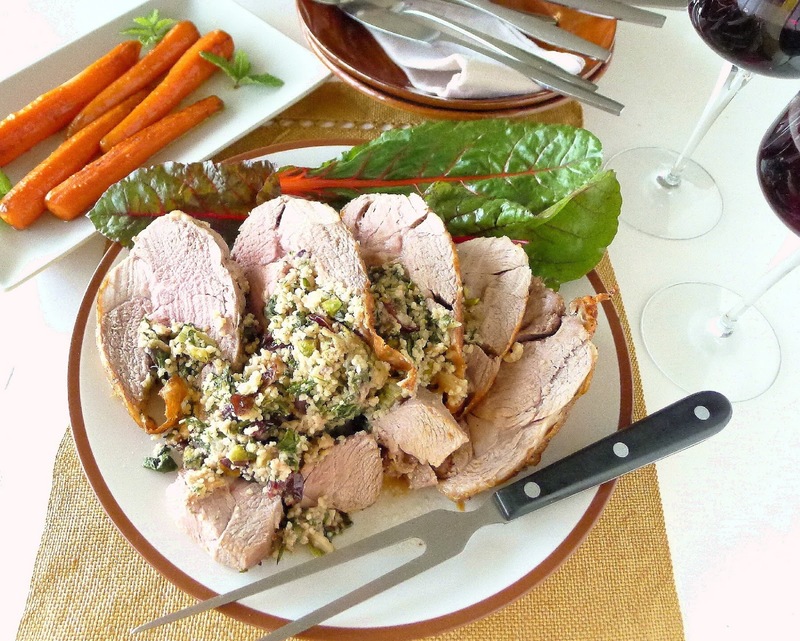 Remove lamb to a cutting board and allow it to rest for 20 minutes before cutting in thick slices. The stuffing will be loose and may need a spoon for serving. 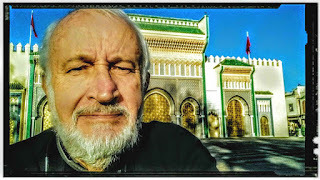 Thanks to my friend Dominique Dallet for his photos of traditional Moroccan mechoui. See more of his work at http://www.jddallet.com/. Lamb Stew with Red Peppers. Grilled Leg of Lamb with Onion Marinade. Roast Lamb with Spring Herbs. We seem to have a lot of April birthdays in our family—grandparents, cousins, my son Benjamin. So there’s inevitably at least one birthday cake on the agenda. My usual favorite for birthdays is a carrot cake, which is big enough to serve a party. For Ben’s spring birthday the cake was always accompanied by strawberries. Son Daniel would get pomegranates for an October birthday. 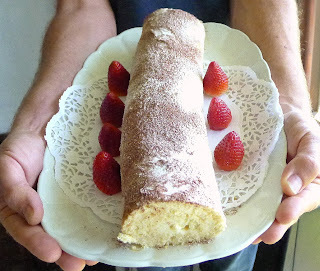 "Gypsy's arm" cake roll, lovely for spring birthdays. 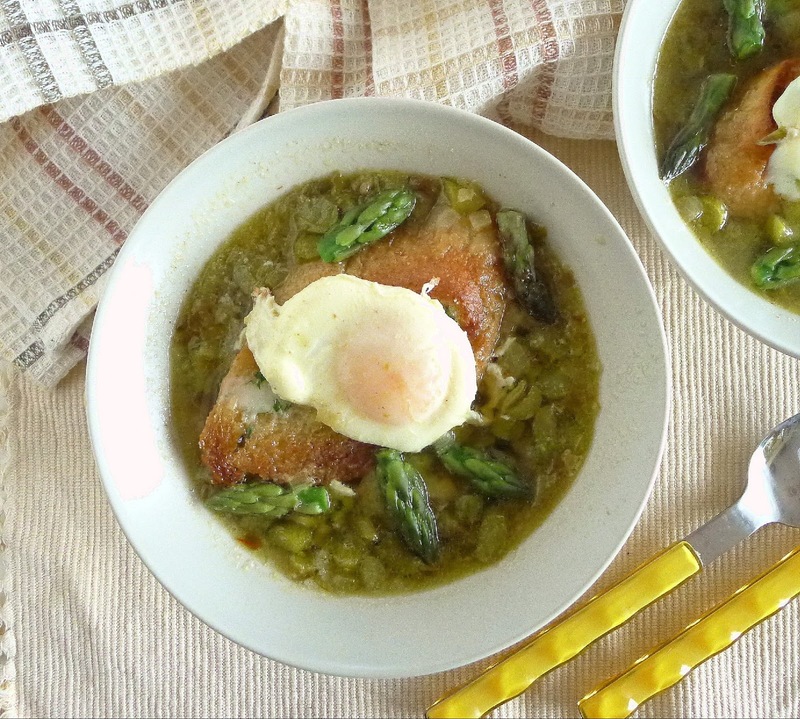 Serve with bubbly cava to celebrate. 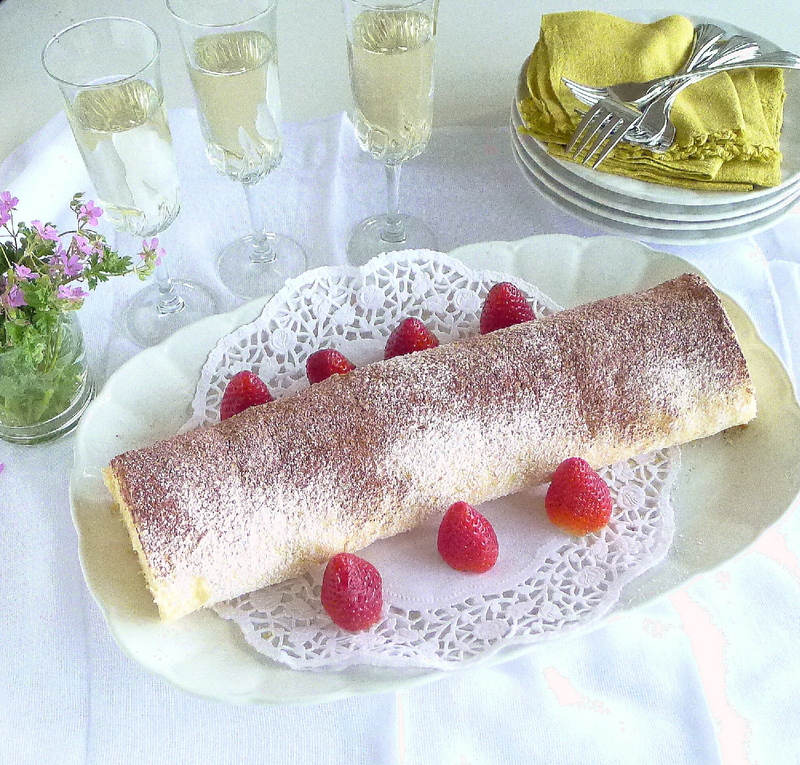 This year I decided to do something different—a roulade filled with white chocolate mousse. 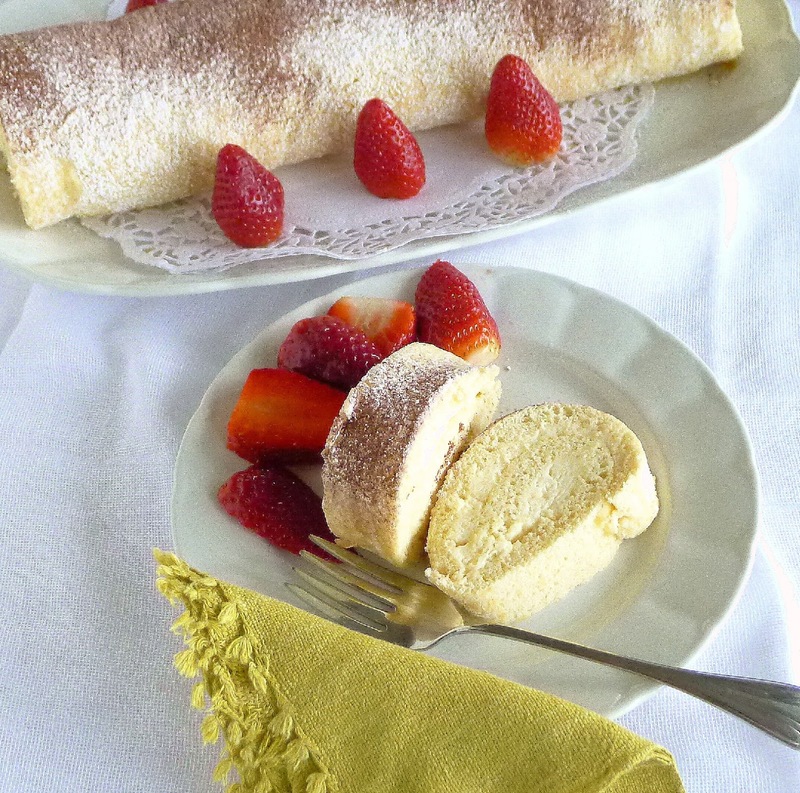 In Spanish, it’s called brazo de gitano—meaning “gypsy’s arm,” presumably because the filled and rolled cake sort of looks like an arm. I’ve noticed that in current pastry packaging, the cake is just called “brazo.” The gypsy designation has disappeared, perhaps because singling out that ethnic group is not politically correct in this day and age. Ben was off to a birthday barbecue afternoon, shared with a friend with a birthday the day before his. He decided that he wanted a carrot cake too. He got it started; I finished it up. Both cakes went to the party! Cake filling is a white chocolate mousse. Cake and filling are light and sweet. Strawberries are a nice accompaniment. Use either the Custard Cream Filling or the White Chocolate Mousse Filling for this rolled cake, also called roulade, Swiss roll or jelly roll. (You will need some custard cream to make the white chocolate mousse; the remainder can be saved for another pastry.) If using the plain custard, flavor the cake and filling with grated lemon zest. If choosing the white chocolate, flavor it with vanilla. While still warm, roll up the sponge layer with the towel. The cake—a simple sponge—bakes in a sheet pan lined with parchment. While still warm, unmold it onto a clean dish towel that has been lightly sprinkled with confectioners’ sugar. 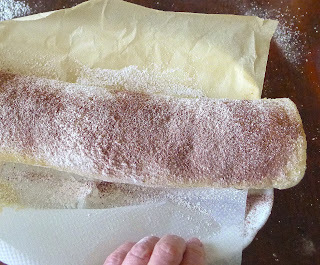 Roll cake up with the towel. When the filling is ready, unroll the cake, spread the filling and use the towel as a guide to roll the cake around the filling. Use the towel to lift the cake and ease it onto a serving platter. Preheat oven to 350ºF. Prepare a jellyroll pan or rimmed baking sheet, 11 X 17 inches. 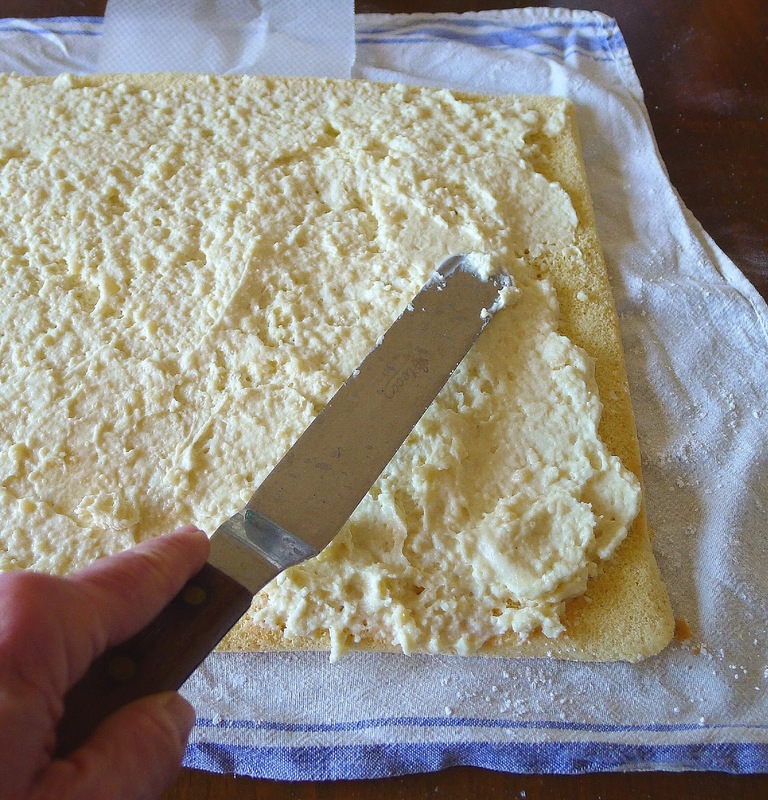 Brush it with oil, then place a sheet of baking parchment on the bottom. Place the egg whites in a mixing bowl and beat them at high speed until stiff. In another bowl, combine the yolks and sugar. Beat on medium speed until thick and pale. Beat in a quarter of the egg whites. Then fold in remaining whites. Sift the flour, baking powder and salt into the batter and fold it in with the vanilla. Spread the batter evenly in the baking pan. It will be very thin. Bake until cake springs back when pressed in the center, about 12 minutes. Spread a clean dish towel on a work surface and sprinkle it with 1 tablespoon of confectioners’ sugar. Reverse the cake while still warm onto the towel. Peel off the baking parchment. While cake is still warm, roll it with the towel into a long cylinder. 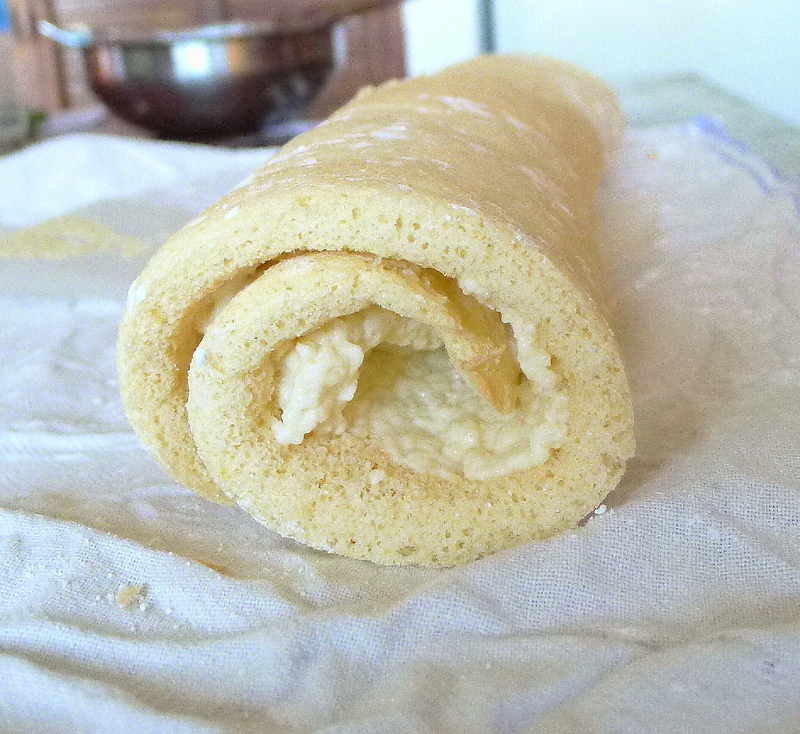 Unroll the cake and spread it with the custard cream filling or white chocolate mousse. 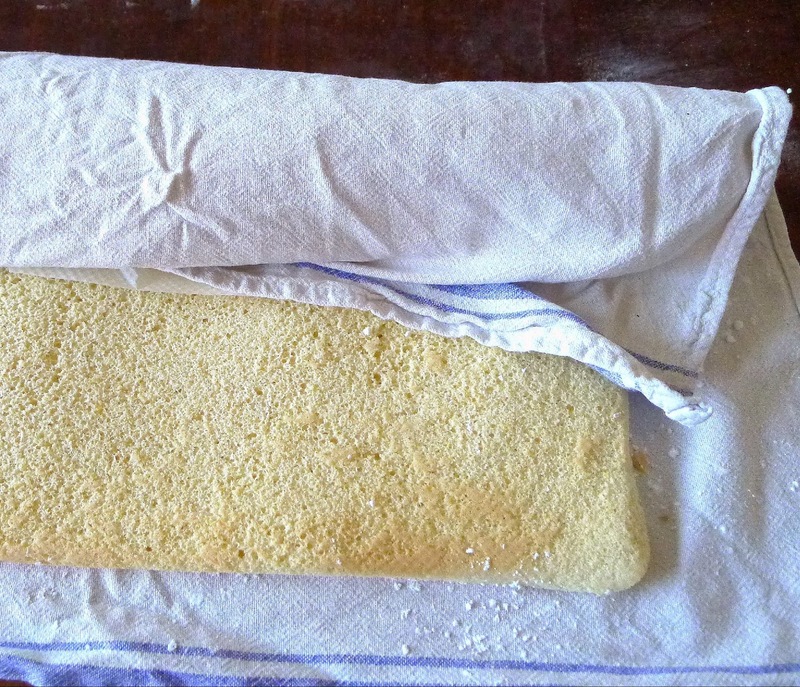 Using the cloth as a helper, roll up the cake, enclosing the filling. 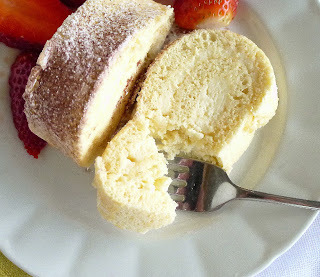 Roll the cake onto a serving dish and allow it to cool. Sift remaining powdered sugar over the top. Sift cocoa over the sugar. Refrigerate the cake. Use a serrated knife to slice it. Use an offset spatula to spread mousse on the cake. 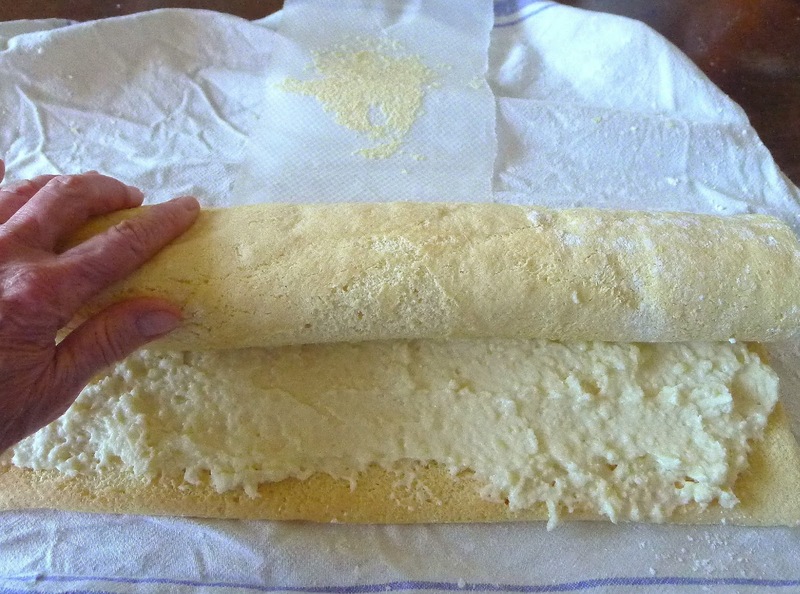 Roll the cake, enclosing the mousse filling. The filled and rolled cake. Ends can be trimmed. Place strips of parchment alongside the cake and sift sugar over it. Remove parchment with excess sugar. Sift cocoa over the sugar. Makes 2 cups of custard. You will need only 2/3 cup to make the White Chocolate Mousse. The custard also can be served as a pudding or spooned over fresh fruit. 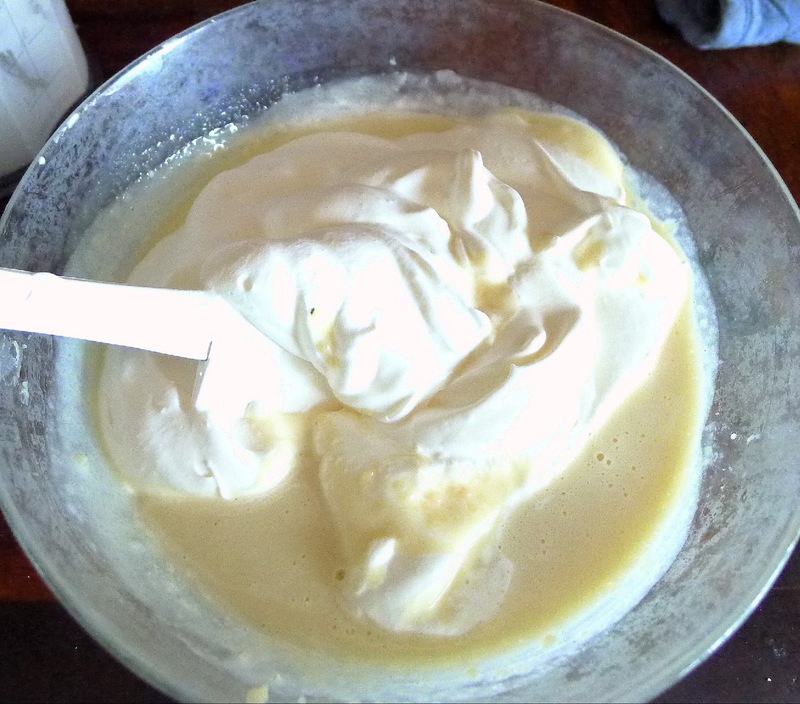 If using the custard cream for the White Chocolate Mousse, it can be prepared in advance, refrigerated, and melted along with the chocolate. In a bowl combine ½ cup of the milk and the cornstarch. Stir until it is very smooth. Add the sugar and egg yolks to the cornstarch and beat until smooth. Scald the remaining milk. Pour it through a strainer into a heat-proof pitcher. While beating the egg mixture with a whisk, slowly pour the hot milk into the eggs. Place the custard mixture in a clean pan on a medium heat, beating constantly, until it thickens. Cook, stirring, on a low heat 5 minutes more. Remove and stir in the vanilla. Beat the custard well, then let it cool before spreading on cake. Chilling bowl and beaters makes whipping the cream faster. Sprinkle gelatin over water and allow to soften 5 minutes. Set a heatproof bowl over a pan of simmering water. Put in the custard cream and the chocolate. Heat, stirring frequently, until chocolate is melted. Add the gelatin and stir until dissolved and the custard cream is smooth. Remove from the heat. Scrape into a chilled bowl. Fold whipped cream into white chocolate. Beat the cream until stiff. 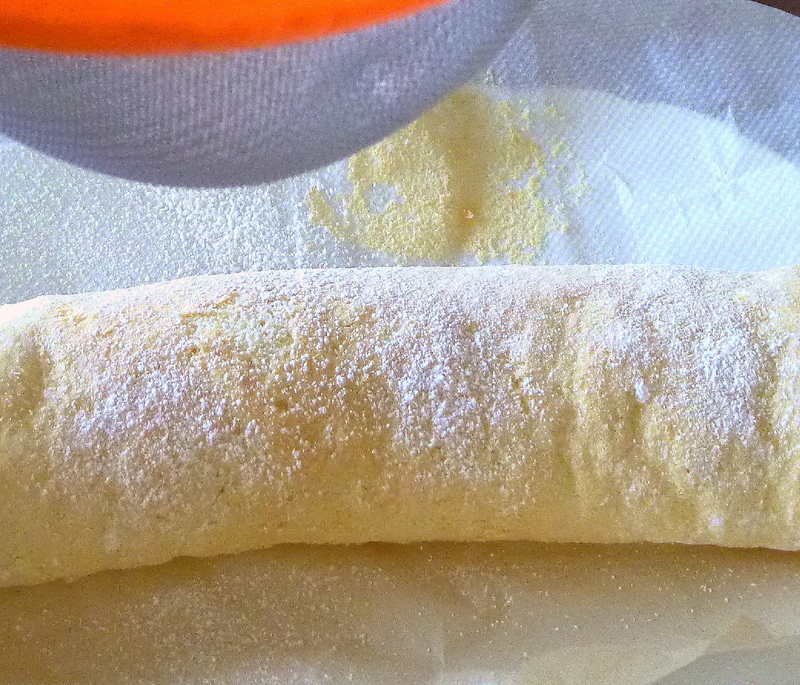 Beat a scoop of the cream into the chocolate-custard filling, then fold the rest of the cream into the filling. 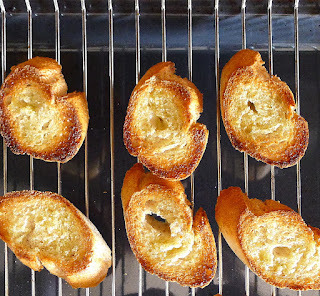 Refrigerate 15 minutes. The mousse filling is now ready to spread on the cake. 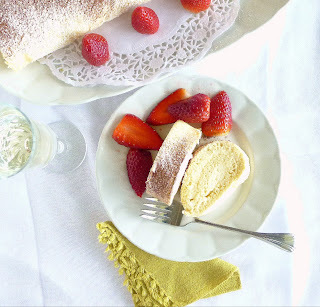 Why is the cake called a "brazo"? It does sort of look like an arm. Birthday boy, Ben, gets a carrot cake too. 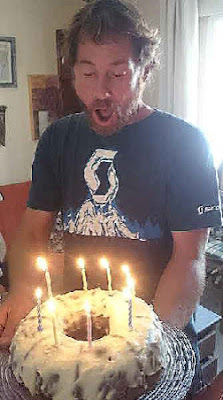 Not nearly enough candles! 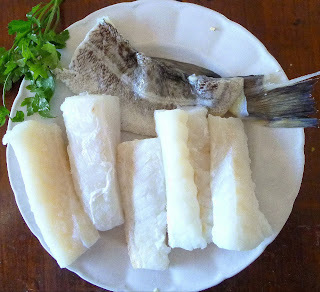 As I was putting pieces of bacalao to soak, in preparation for my annual Holy Week visitation to salt cod, I realized that my Good Friday postings have amounted to a cod fish aficionado’s tour of Spain. Cod, potatoes and cauliflower with tangy red ajada sauce. 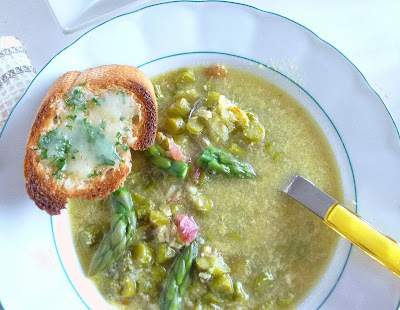 Garden peas add a springtime touch. 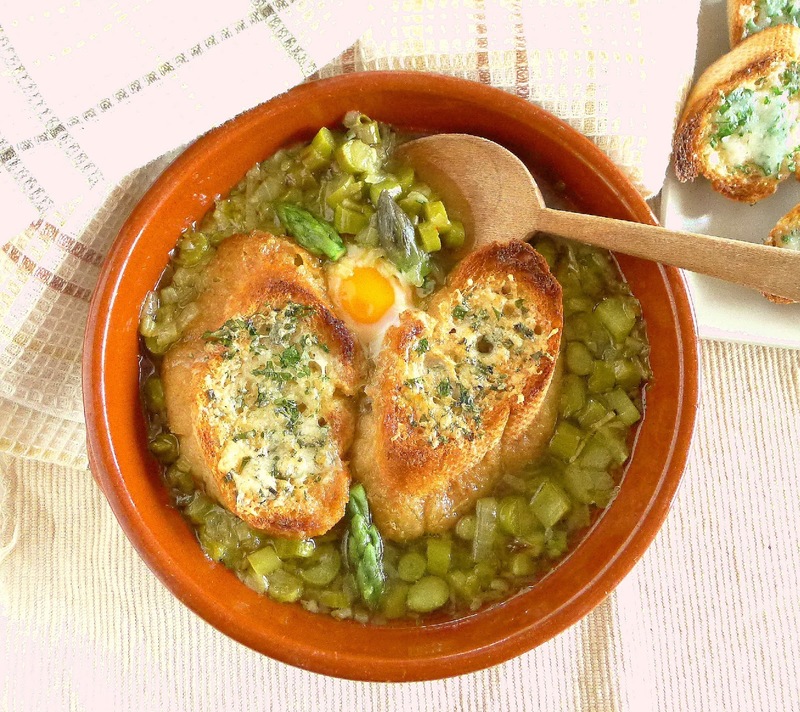 This year I’ve headed to Galicia, the far northwest corner of Spain, to sample a popular cod recipe that is ever-so-easy. 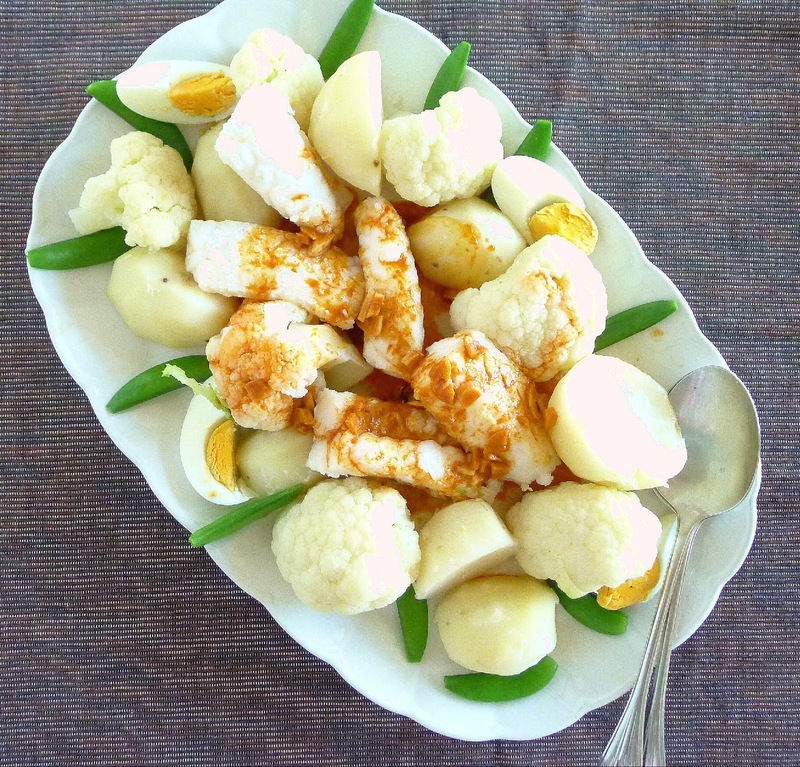 Potatoes, cauliflower and cod are simmered in water, then served with a tangy ajada sauce made with garlic, pimentón and vinegar. 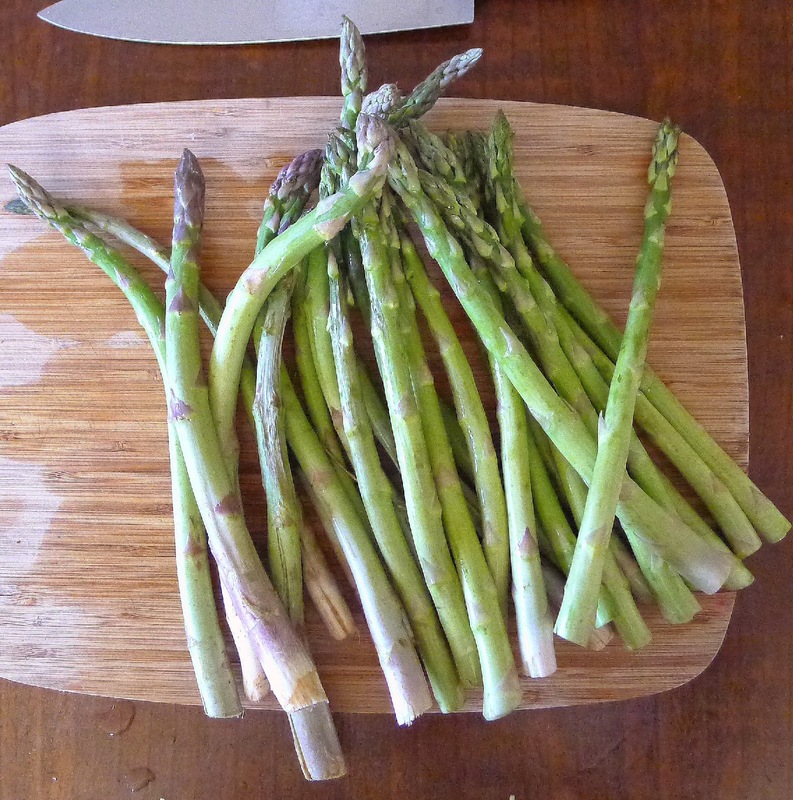 It’s a dish also served on Christmas Eve, so for the spring holiday, I’ve added fresh green sugar snap peas from the garden. 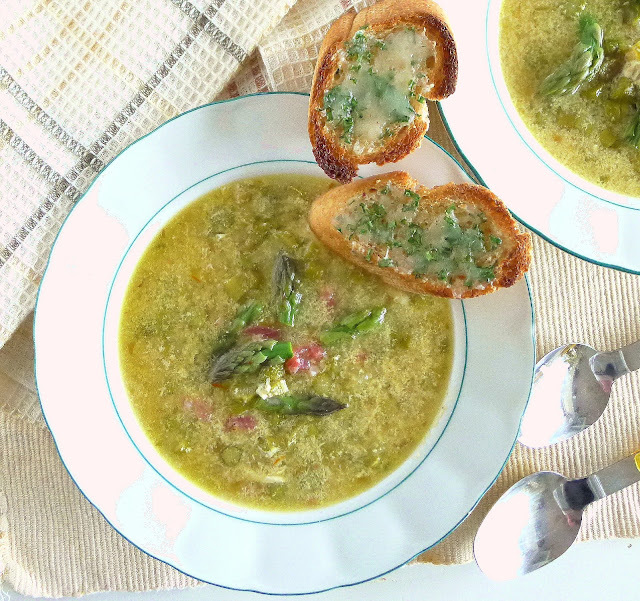 Serve it with a crisp Albariño white wine from Galicia’s Rias Baixas. Where to next year? I have yet to visit the bacalao dishes of Valencia, of Extremadura, or of Cantabria. 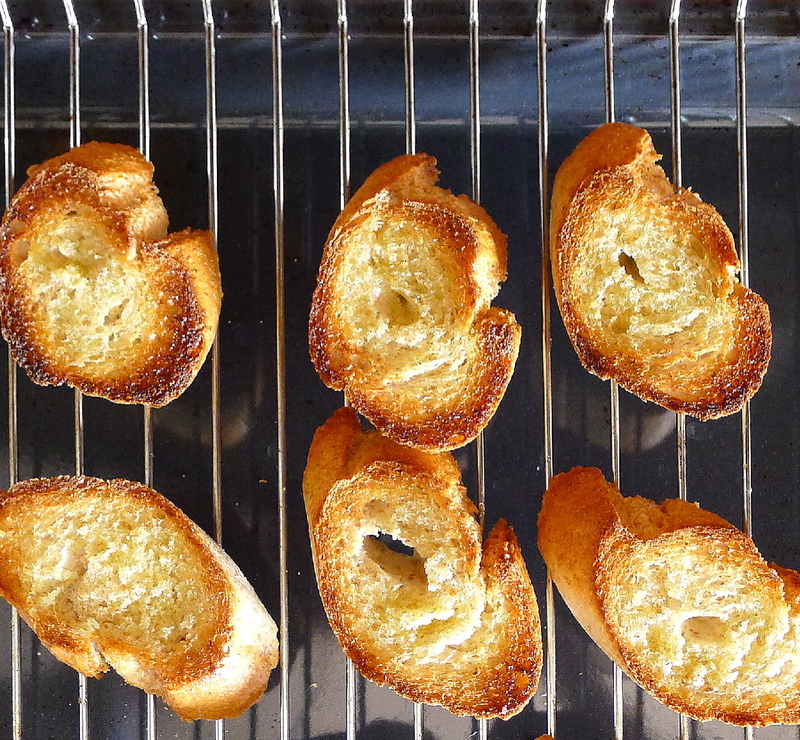 After which, I can begin again, as every region of Spain has a dozen or more recipes for this season. 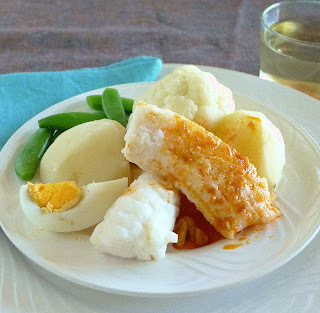 Crisp Albariño is the wine to serve with the Galician cod dish. Spoon some sauce over cod and vegetables, serve the rest on the side. 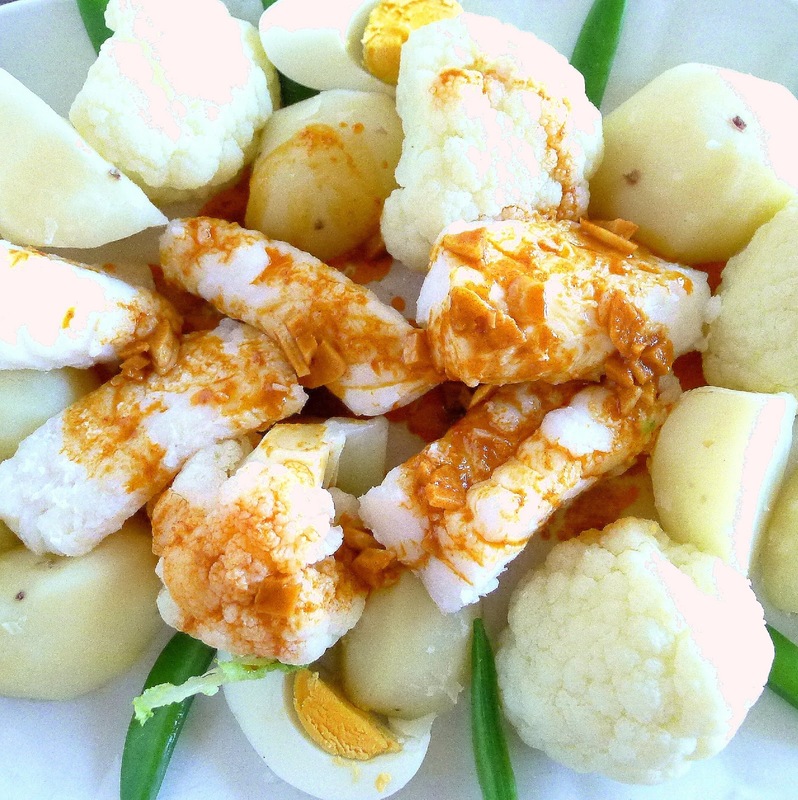 Traditionally, the potatoes, cauliflower and cod are all cooked in one pot of water. I’ve chosen to steam the cod separately, which gives it a nice, fluffy texture. If you prefer to cook the cod in the water, add it at the very end, letting it barely simmer for 5 minutes. Overcooking toughens the cod. Skinless and nearly boneless pieces are cut from center of the cod. Tail is added to flavor the vegetables. The Galicians have dozens of varieties of potatoes. I find that waxy-red boiling potatoes are best for this dish, as they won’t disintegrate when cooked. Traditionally the ajada sauce is made with ordinary unsmoked pimentón (paprika). You can add some smoked pimentón as well. 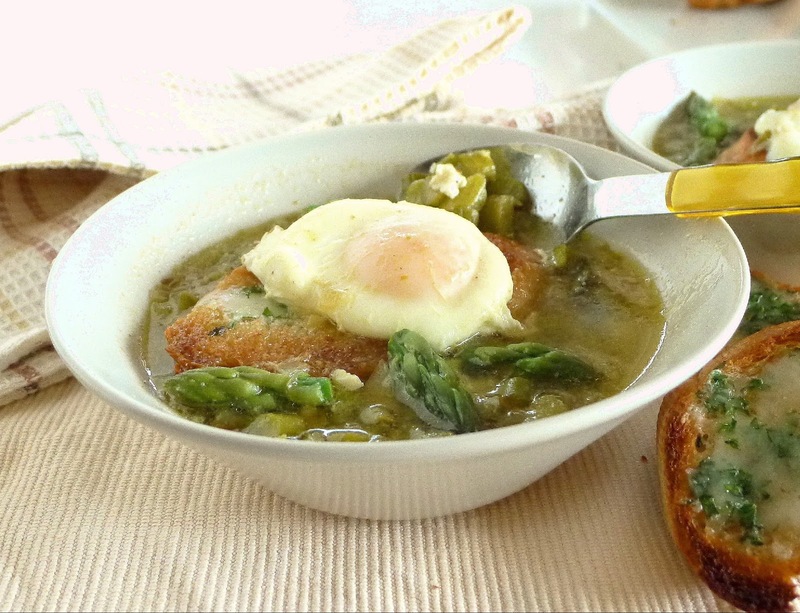 Start this recipe 2 or 3 days before serving in order to allow time for the cod to soak. 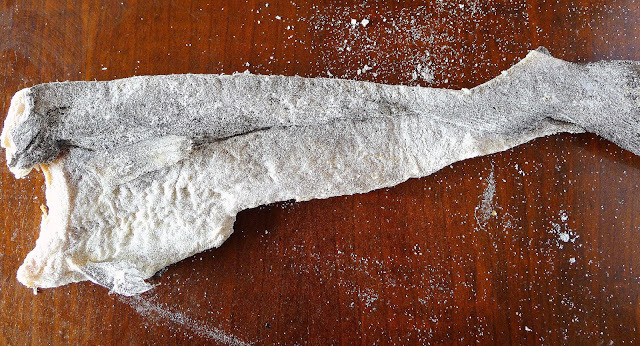 Wash the pieces of salt cod to remove surface salt. 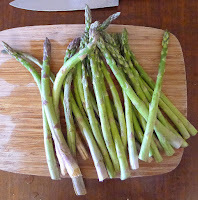 Place them in a glass container and cover with cold water. Cover the container and refrigerate. Soak the cod for 36 hours, changing the water 6 times during the soaking period. Drain well and set aside. Bring 8 cups water to a boil with 1 teaspoon salt and parsley. Add the potatoes, egg and onion. Cook until potatoes are almost tender, 10 minutes. Remove the egg and plunge it in cold water. 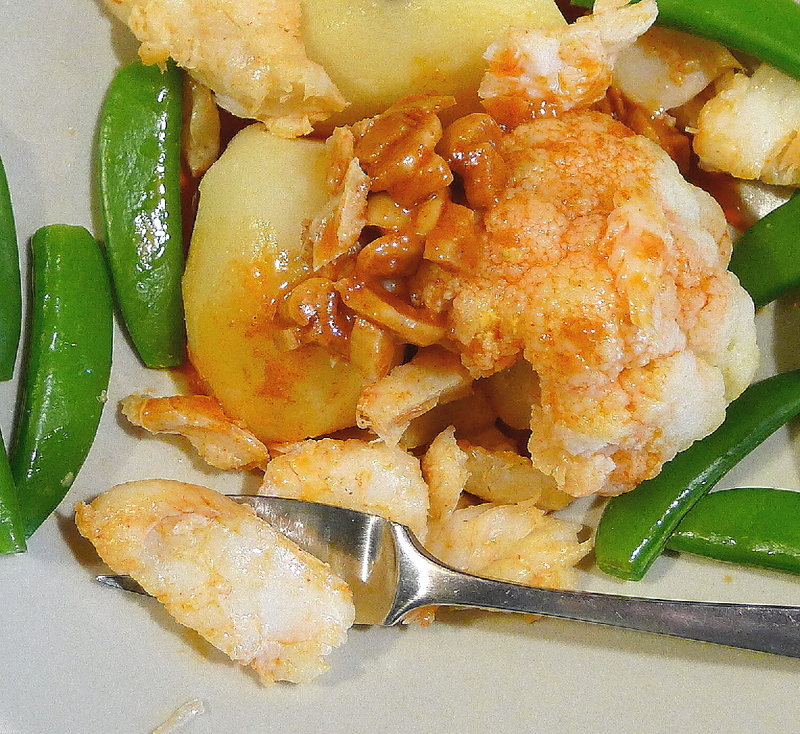 Add the cauliflower and extra piece of cod to the potatoes. 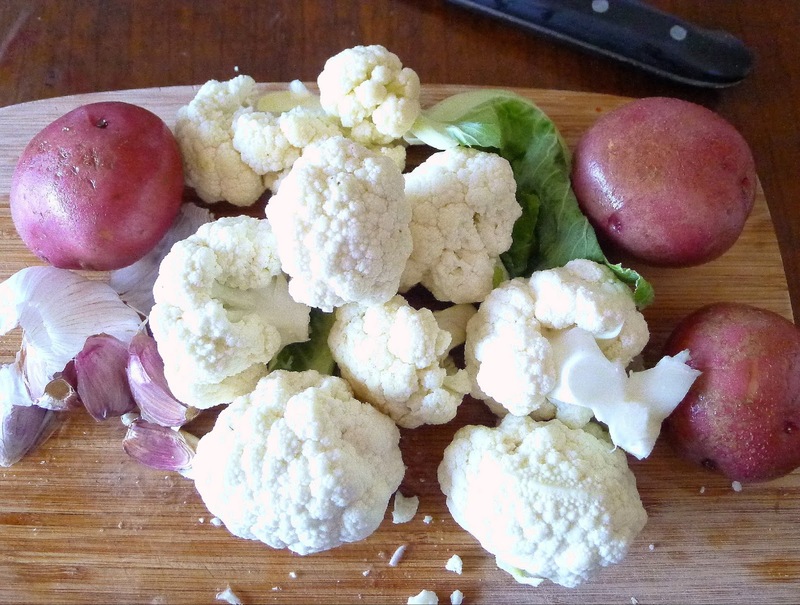 Bring again to a boil, reduce heat and cook until cauliflower is just tender, about 5 minutes. Do not overcook. Cook the peas, if using, in the same pot for 1 minute. Drain the potatoes and cauliflower and keep them warm. 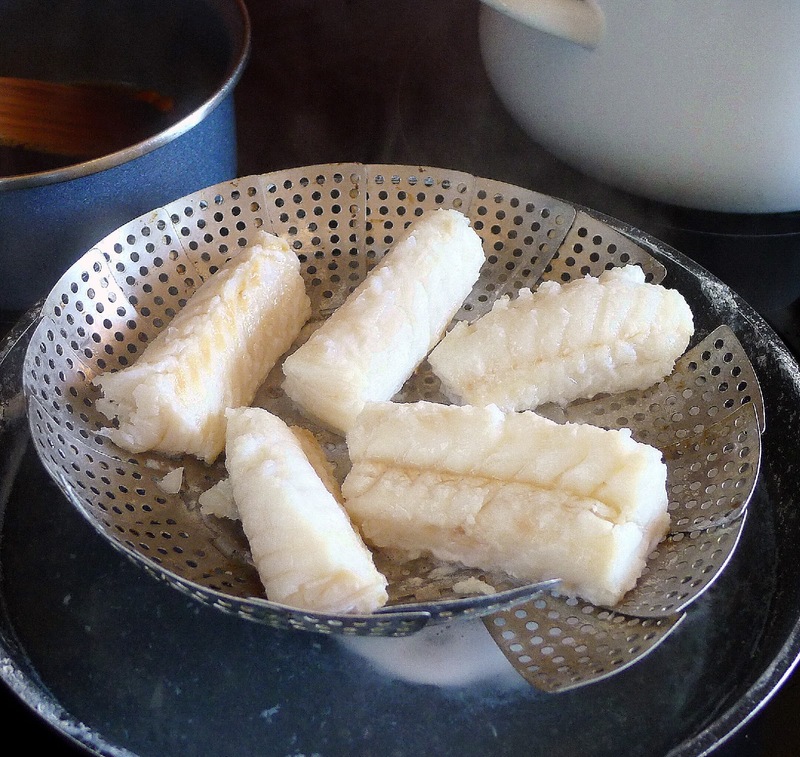 Steaming cod over boiling water keeps it tender, prevents it from disintegrating in cooking. Meanwhile, place a steaming rack in a pan with at least 1 inch of water. Bring the water to a boil. Place the pieces of salt cod on the rack, cover and reduce heat so the water bubbles gently. Steam the fish until it flakes easily, about 8 minutes. 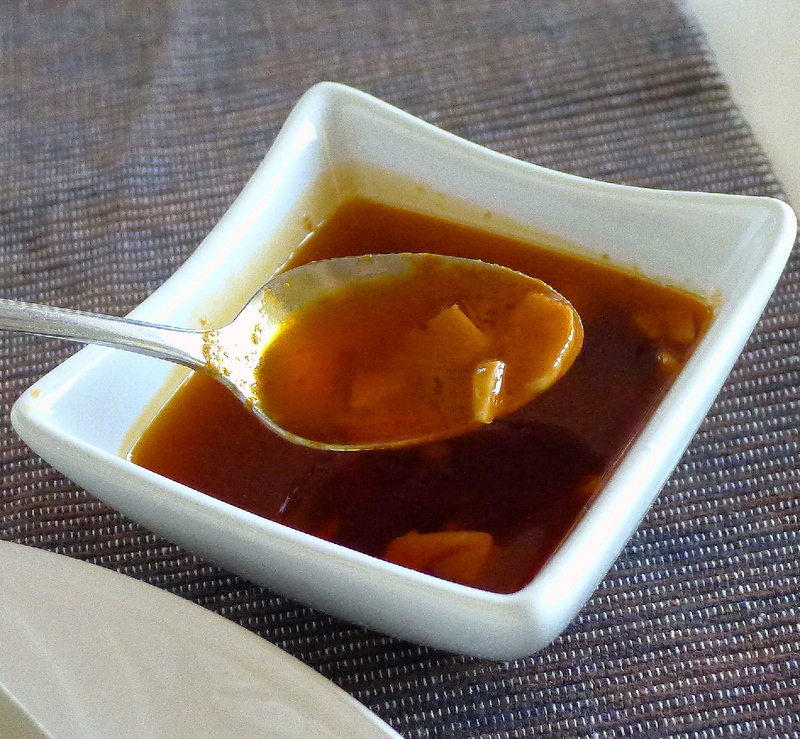 Ajada sauce is olive oil, garlic and three kinds of pimentón. 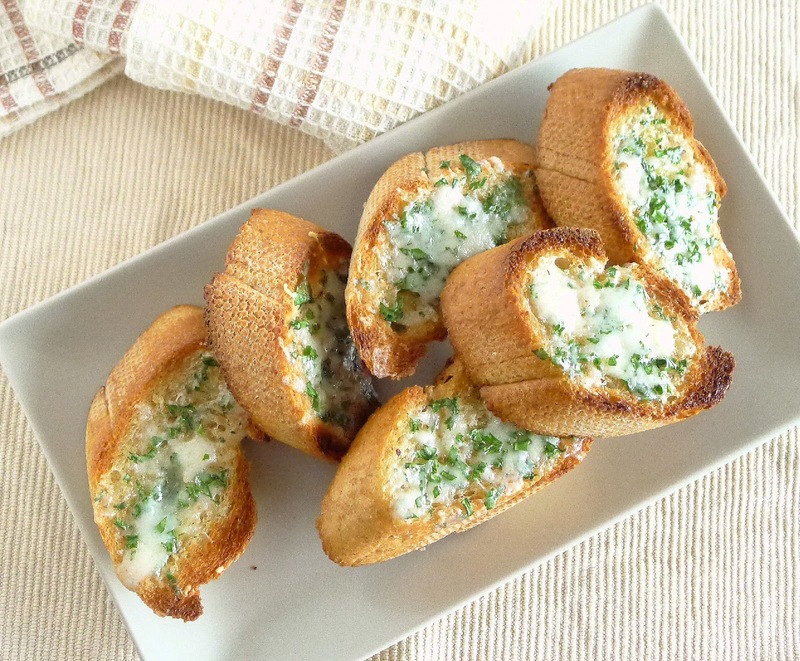 Meanwhile, slice the garlic crosswise or chop coarsely. Heat the oil in a small saucepan. Add the garlic on medium heat and cook it until it begins to turn golden. Remove the pan from the heat. Stir in the three kinds of pimentón, the vinegar and hot water. Add salt, if needed (cod may not need extra salt). Peel and cut the cooked egg in quarters. 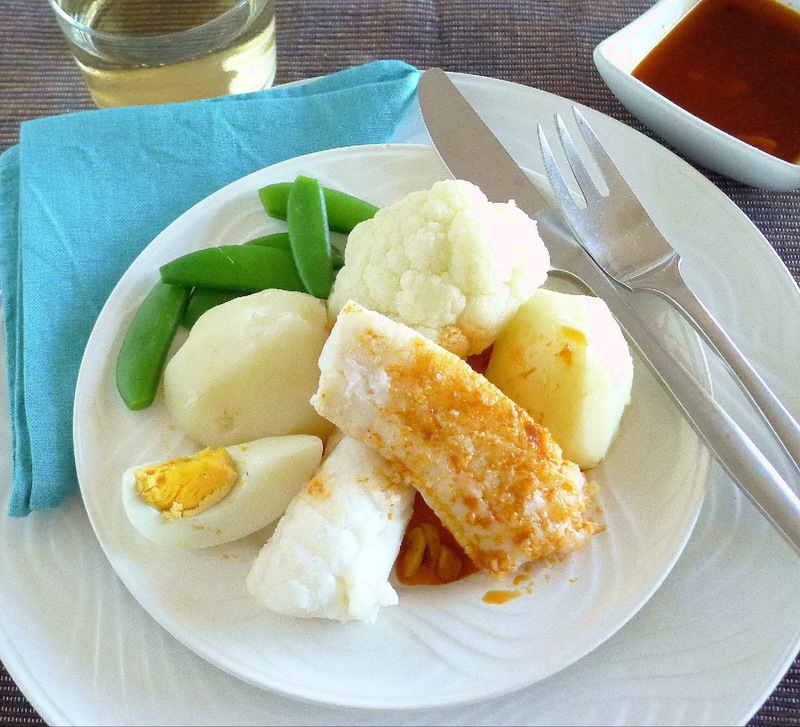 Serve the potatoes, cauliflower and pieces of cod with peas, if using, and quartered egg. Spoon some of the garlic-pimentón sauce over the cod and vegetables. Pass remaining sauce at the table. 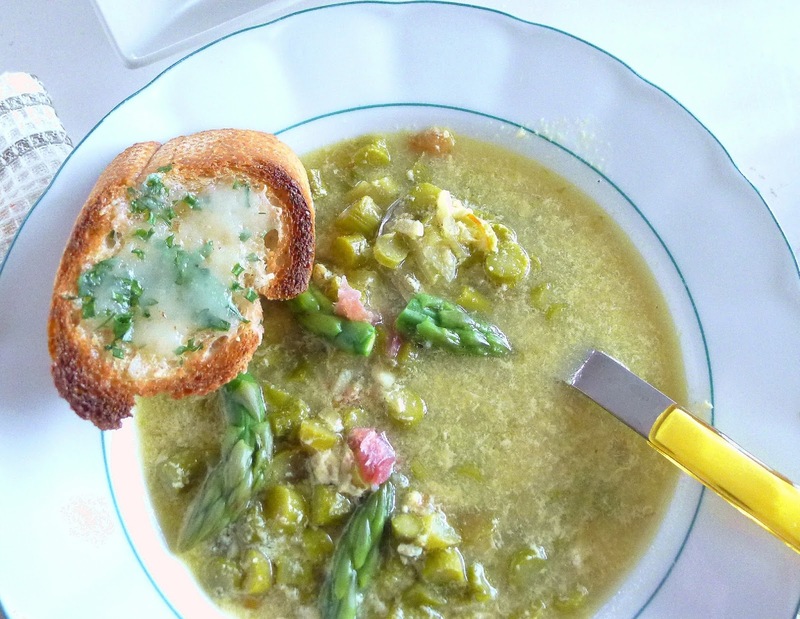 If you have not used peas, garnish the plates with parsley.